October is just around the corner, so that means it is once again time to weigh in on some Halloween costume options for Eddie. This decision may also play a part in what Kristen and I will be. Don't forget to elaborate on your choice in the comments. This would fit right into my ongoing, multifaceted effort to force my Batman obsession on Eddie. Lately I have been imagining him as a rebellious, angst-ridden teen who has decided to hate Batman just to spite me. Kristen and I could fill out the Bat family as Robin and Batgirl. Eddie's wispy blonde hair already spikes up quite nicely. Then we could add some shredded jeans and maybe a temporary tattoo on his bicepl. The main problem I forsee is finding a toddler-size leather jacket with cutoff sleeves. In keeping with the 80's rock star theme, Kristen and I could be Hall & Oates. Who gets to be Hall and who gets to be Oates? That's for another poll to decide. Since Eddie has recently taken to draping things over his face and wandering around, we could go the bargain route and cut some eye holes in a white sheet for him. Or we could splurge on something more "official" like the costume pictured above. Then I could be a ghostbuster, and, based on the popularity of a recent Facebook status update, Kristen could be Zuul. Eddie unconditionally loves pups of all shapes and sizes, so this seems like an easy choice. 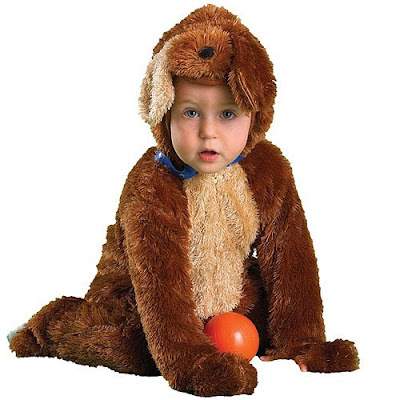 Every time he wore his costume he would undoubtedly feel compelled to point at himself and say "pup!" over and over. But would it be too similar to last year's Chewbacca costume? We don't want to repeat ourselves. Plus I have no idea what Kristen and I would be. Batman, just because I want to see Dave in the Robin suit. What happened to curious george with Dave as the Man with the Yellow hat? 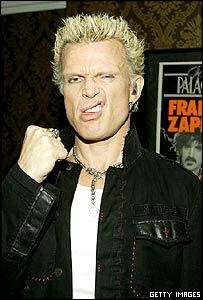 Billy Idol all the way, that is not even a question. 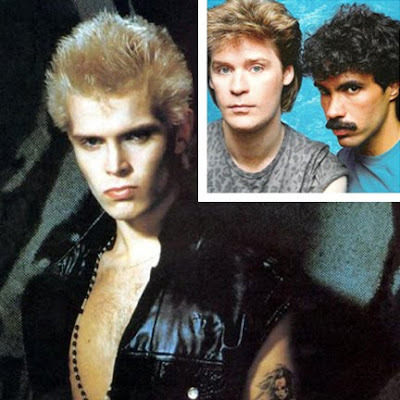 But more not to see Eddie as Billy Idol but to see Dave and Kristen as Hall and Oates, especially if Kristen gets to be the one with the mustache. I voted for the Ghost because, out of the options, I would prefer to be Zuul. My second choice would be Batgirl (with Ed as Batman, of course), but I'm not too sure about Dave in that Robin Suit. Sorry honey. I'd prefer not to dress up as Hall or Oates. Besides, nobody would know what we were. I'm diggin the Ghostbuster idea, but how about you go as the Keymaster, since Kristen can be the Gatekeeper. And if Eddie's gonna be a ghost, he should be slimer, no? 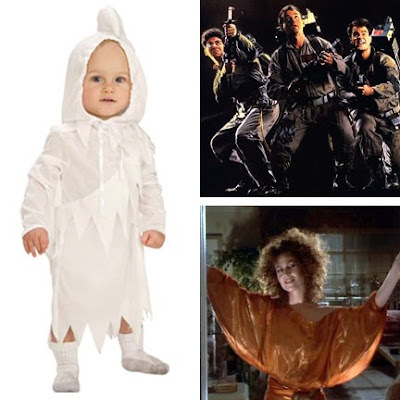 OR he could go as the Ghostbusters logo and you could make a big red circle dash thing for him to wear. That's gold! "During the rectification of the Vuldrini, the traveler came as a large and moving Torg! Then, during the third reconciliation of the last of the McKetrick supplicants, they chose a new form for him: that of a giant Slor! Many Shuvs and Zuuls knew what it was to be roasted in the depths of the Slor that day, I can tell you!" I think Eddie should be Batgirl. I'm gonna go with Batman, mostly because I like the idea of Dave and Kristen dressing up as his side kicks. Can't wait to see Kristen as batgirl! I voted for Billy Idol, because really, the only thing Eddie needs to master to fully embody the has been rock star is his famous lip curl. I'm sure Eddie would look hot in this little number. Many Daves and Zuuls who had to use the interwebs to find movie quotes knew what it was to be roasted in the depths of the Slor that day, I can tell you! definitely the puppy. I have a 4 year old nephew and he already has his next 4 Halloween costumes picked and they are all superheroes. Go with something cuddly like the puppy because you won't get another chance. Eddie could be a monkey and you could be zoo keepers. Who the hell are Hall and Oates? Did I miss something? I vote for Batman...! 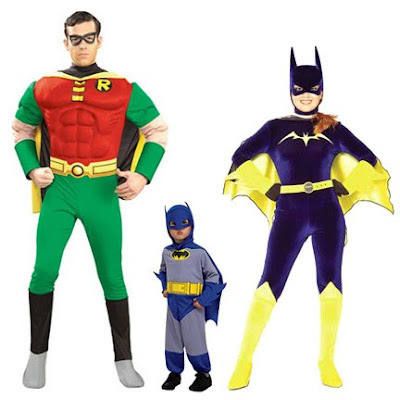 I am too planning to get a Batman costume for my son from Costume Kingdom. Holy Mackinaw! It's a CATastrophe!